U.S. National Security Adviser John Bolton, left, and Russian Security Council chairman Nikolai Patrushev talk prior their official talks in Moscow, Russia, Oct. 22, 2018. Russia signaled Monday it is willing to consider mutual complaints the United States and it have about their continued implementation of the 1987 nuclear weapons treaty between the two world powers. Russian Security Council chairman Nikolai Patrushev expressed Moscow's "readiness for joint work" on the pact as he met in the Russian capital with his U.S. counterpart, U.S. national security adviser John Bolton. For his part, Bolton said that the U.S. had not made any decision to deploy missiles in Europe targeting Russia if the Intermediate-Range Nuclear Forces Treaty is scrapped. FILE - Soldiers prepare to destroy a ballistic SS-19 missile in the yard of the largest former Soviet military rocket base in Vakulenchuk, Ukraine, Dec. 24, 1997. Their talks came two days after U.S. President Donald Trump announced his intention to pull out of the agreement that bans the United States and Russia from building, testing, and stockpiling ground-launched nuclear missiles with a range from 500 to 5,000 kilometers (310-3,400 miles). The U.S. leader accused Russia of building and testing missiles that violate the accord. Since Trump's declaration, Moscow has defended the treaty, with Dmitry Peskov, President Vladimir Putin's spokesman, saying the U.S. decision "will make the world more dangerous." He rebuffed the U.S. claim that Russia had violated the terms of the pact. The Russian Security Council said Patrushev had told Bolton that the treaty's "abrogation would deal a serious blow to the entire international system of nuclear non-proliferation and arms control." The two security officials, according to the Russian statement, also discussed a possible five-year extension of another arms control agreement, the Strategic Arms Reduction Treaty that took effect in 2011 and is set to expire in 2021. U.S. National Security Adviser John Bolton, left, and Russian Foreign Minister Sergey Lavrov shake hands prior to their talks in Moscow, Oct. 22, 2018. 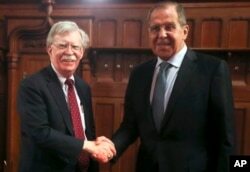 Bolton also held talks with Russian Foreign Minister Sergei Lavrov and is set to meet Tuesday with Putin. Before the Patrushev-Bolton talks, Putin spokesman Peskov contended that "it is the United States that is eroding the foundations and main elements" of the three-decade-old nuclear agreement with its missile defense systems and use of drones. 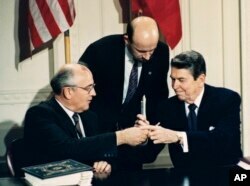 FILE - U.S. President Ronald Reagan (R) and Soviet leader Mikhail Gorbachev exchange pens during the Intermediate Range Nuclear Forces Treaty signing ceremony in the White House East Room in Washington, D.C., Dec. 8, 1987. The Kremlin spokesman said that if the United States goes on to develop new missiles, then Russia would be forced to respond in kind. He said Russian officials want to get more information about the U.S. plans regarding the treaty in their talks with Bolton. Former Soviet President Mikhail Gorbachev signed the deal with the late U.S. president, Ronald Reagan, at the White House in 1987. "Do they really not understand in Washington what this could lead to?" Russia's Interfax news agency quoted Gorbachev as saying. "Washington's desire to turn back politics cannot be supported. Not only Russia, but all those who cherish the world, especially a world without nuclear weapons, must declare this." President Donald Trump speaks during an interview with The Associated Press in the Oval Office of the White House, Oct. 16, 2018, in Washington. Without specifying how Russia violated the treaty, Trump on Saturday appeared to say Moscow will not get away with it. "Russia has violated the agreement. They have been violating it for many years. And we're not going to let them violate a nuclear agreement and go out and do weapons and we are not allowed to," he said. U.S. officials going back to the Obama administration have accused Russia of deliberately deploying a land-based cruise missile to pose a threat to NATO. Russia has denied violating the INF agreement and says U.S. missile defense systems are a violation. Defense advocates in Washington say the INF treaty keeps the U.S. from developing a new generation of weapons in a world that faces new global security challenges. 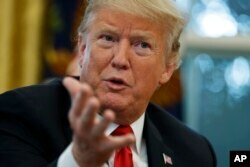 Trump said, "We'll have to develop those weapons, unless Russia comes to us and China comes to us and they all come to us and say let's really get smart and let's none of us develop those weapons, but if Russia's doing it and if China's doing it, and we're adhering to the agreement, that's unacceptable." China is not part of the INF agreement. Beatrice Fihn, the executive director of the International Campaign to Abolish Nuclear Weapons — the coalition that won the 2017 Nobel Peace Prize — said, "By declaring he will leave the INF Treaty, President Trump has shown himself to be a demolition man who has no ability to build real security. Instead, by blowing up nuclear treaties, he is taking the U.S. down a trillion-dollar road to a new nuclear arms race." Dmitry Oreshkin, an independent Russian political analyst, told the Associated Press, "We are slowly slipping back to the situation of Cold War, as it was at the end of the Soviet Union, with quite similar consequences, but now it could be worse because Putin belongs to a generation that had no war under its belt. These people aren't as much fearful of a war as people of (former Soviet leader Leonid) Brezhnev's epoch. They think if they threaten the West properly, it gets scared."